When we sit to design our bridal blouse, there are certain thumb rules we follow. 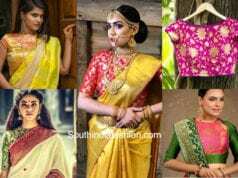 We either use the heavy border of pattu sarees and shun from embroidery or vice versa. How about using both the borders and embroidery and creating one of a kind bridal blouse? These gorgeous blouses are not just perfect as a bridal blouse but you can sport them for any grand function. 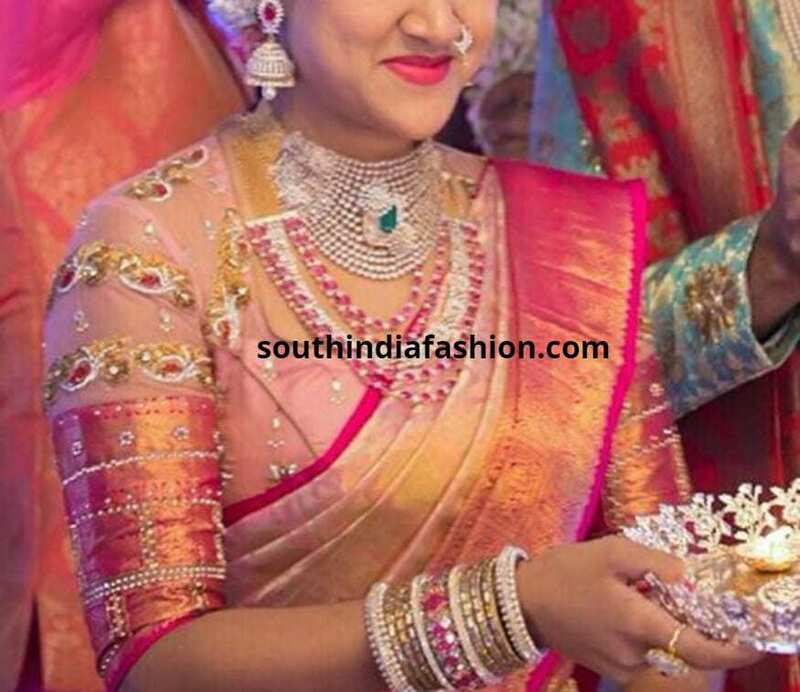 This heavy bridal blouse design is by Bhargavi Kunam. 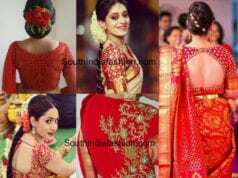 Though the blouse is paired with a pattu saree care is taken not to take out the border. Instead heavy embroidery is made all over the blouse and a thick cord is added above and below the border. 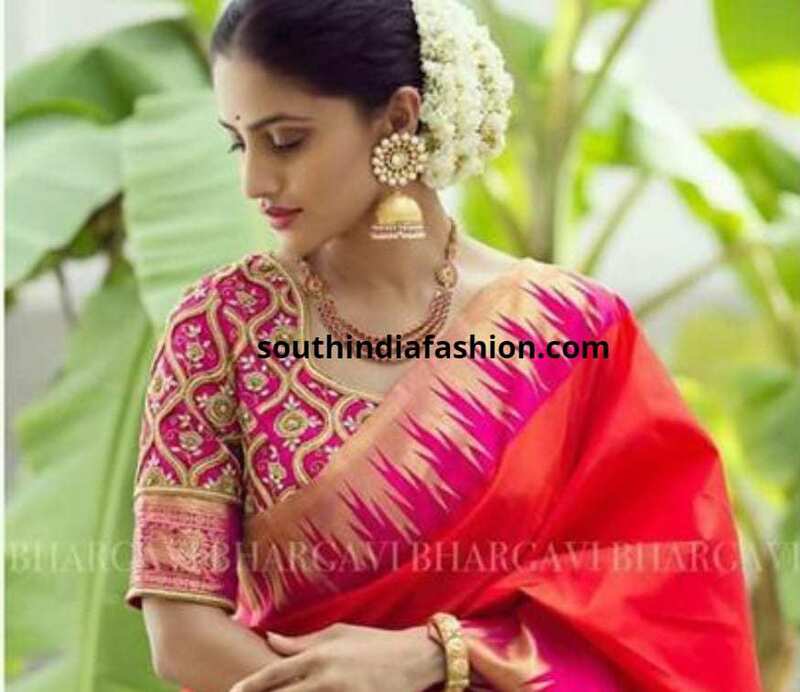 This is undoubtedly one of the gorgeous bridal blouses to team up with pattu sarees. A perfect bridal blouse that is so heavy. Here instead of doing away with the borders the embroidery has been extended even to them and has been enhanced with the use of stones. 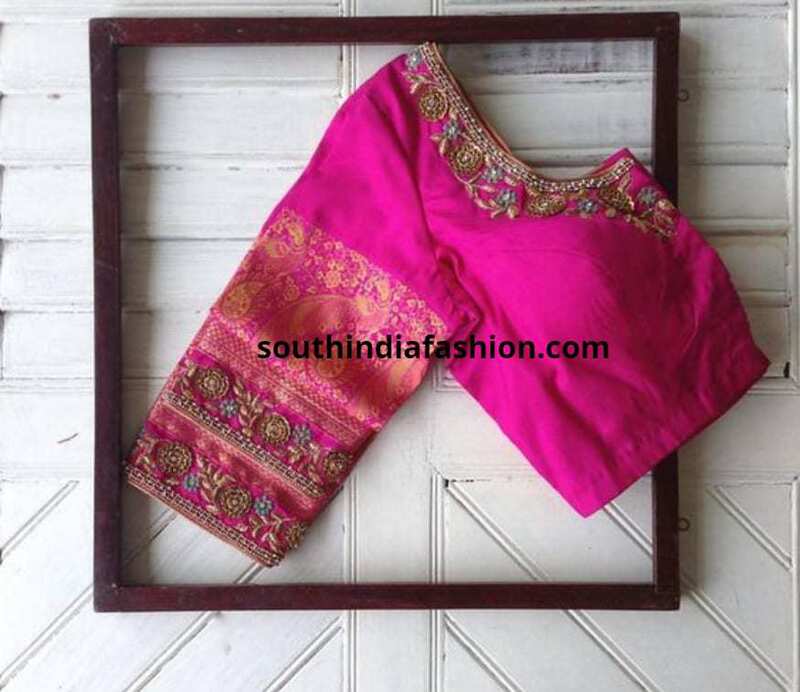 For this contrast blouse that echoes the colors of the saree border, the silk saree color has been woven intricately into the embroidery on the body of the blouse and also as small buttis on the border. 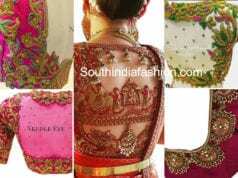 In this contrast color bridal blouse they have gone for the antique gold and saree color heavy embroidery. 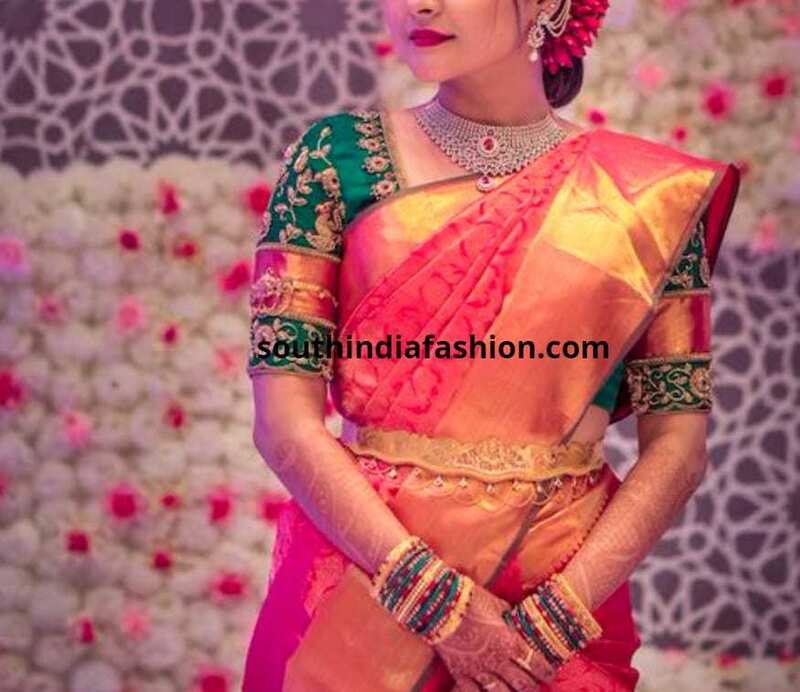 Though the blouse does not come with the border, the saree color border has been attached making the bridal blouse richer. This bridal blouse does not have heavy embroidery done. The arm band style work that has been done at the start of the border makes the blouse look bejewelled and is a great choice even for the bridesmaids. This classic wedding blouse can never go wrong. Choosing heavy work all over the blouse and leaving the border plain, is timeless and will work every time. This bridal blouse has an interesting spin. Check out the use of the two tone fabric and the border attached to the sheer sleeves. 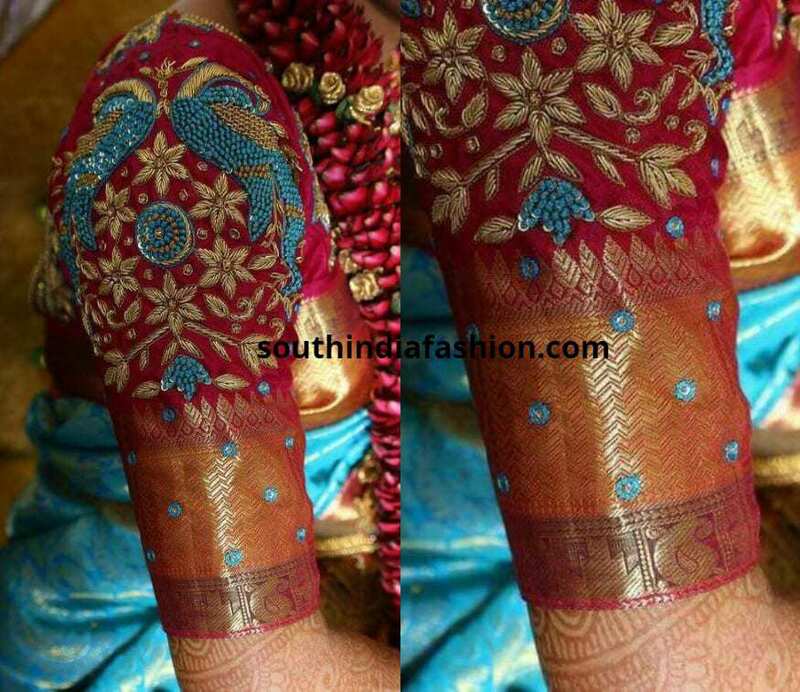 The sheer is not too much and so this will blend beautifully with pattu sarees. This sheer net blouse with long border has two shades of the same color palette. They have added delicate stone work that runs across the border to add in the bling. Yet another great choice of a heavy blouse with just a strip of minimal stone border to the actual border. 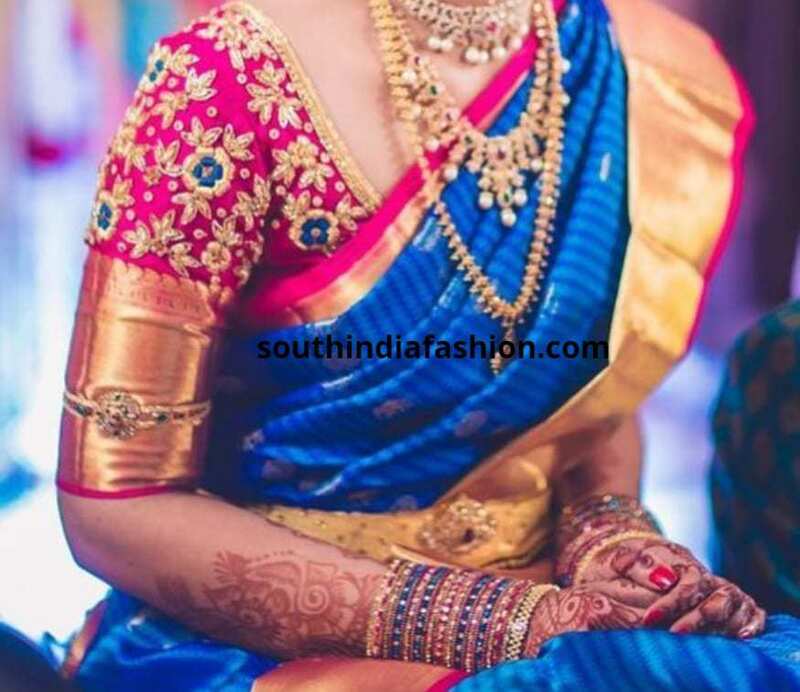 By doing this you can literally use this blouse with a different tone saree as the embroidery has been done only in shades of antique gold and white stones. This is another beautiful bridal blouse from Nyshka design studio. The border is split and added in two different places. This is perfect wedding guest blouse that is simple and elegant. The embellishments around the neckline have been replicated over the border as well. But this does not hamper the beauty of the border, but instead enhances it. The kasu embellished blouse design has been in the spotlight for both brides and guests alike. This toned down kasu blouse is perfect for a simple puja. You can also add a string of kasu below the border too. Here the solid border has been enhanced with delicate work and has been made to look like the extension of the border. The rest of the blouse has been kept relatively simple. You can choose this blouse with both simple and heavy pattu sarees. What we always see is the borders are like a framework to the blouse. Here the twist is adding the border at the start of the sleeve and extending to elbow length with heavy work. So unique and ideal for pattu sarees. 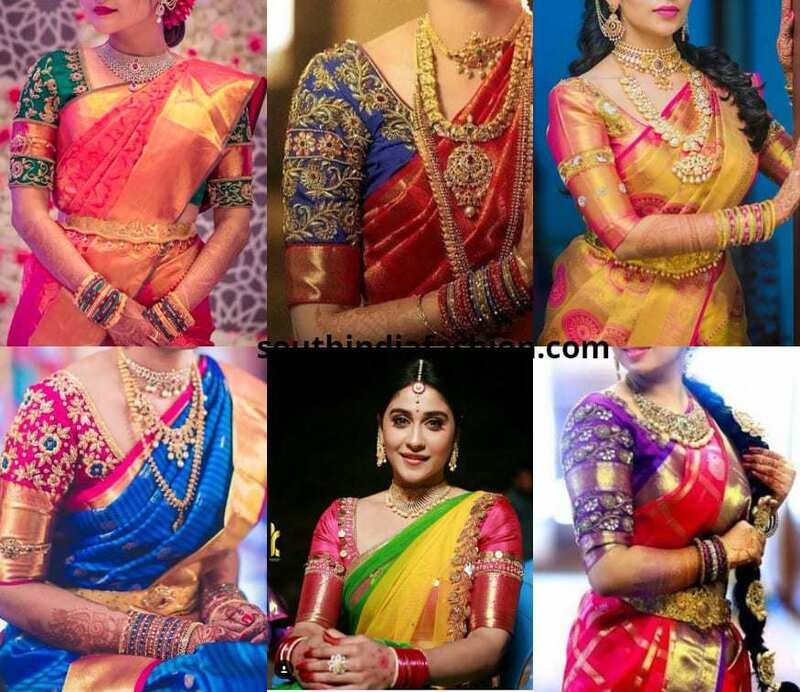 How to bring the saree element with a contrast blouse? The easy answer is to add sleeves from the attached blouse fabric. Instead, how about adding the border to the middle of the sleeves which gives it a new dimension. These 15 bridal blouses are major inspiration for this wedding season for brides, squad and the guests alike!! Try them out and let us know your comments!! 4 Reasons Why Elbow Length Sleeves Blouses Are Fashionable To Wear!